Similar to other universities nearby, The University of Seoul (UOS) has an Open Campus to Seoul citizens to perform its public role. 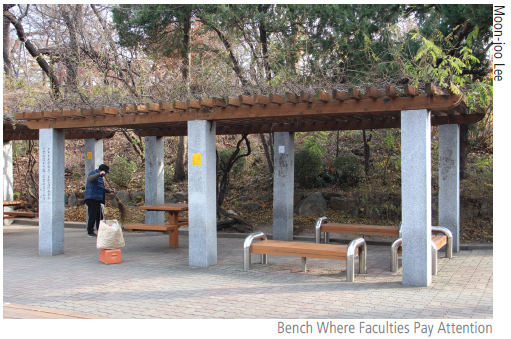 Citing the article from Weekly Donga, issue number 995, UOS campus is a suitable place for citizens to use as a park or trail in that there are few hills so it is very good for elderly people to walk around. Also, there are not enough green spaces or parks in the local district other than our university ground. This makes our campus popular for local residents, using our school as a substitute for lack of neighborhood parks. It is very common to meet citizens who are working out and talking to each other, sitting on benches and having fun. Not only working-out at dawn but citizens are also utilizing our campus day and night, weekdays and weekends. While on campus, however, some citizens cause problems. They do not abide by basic manners which are common-sense, causing an inconvenience to UOS students. Many students often say that our campus feels more like a national park than an educational institute. For the Cover Story, we investigated our Open Campus situation, and looked at the ideal coexistence of our school and local citizens. Currently, almost all of our campus is open to everyone with some limitations. There are about 30 buildings on the campus and with the exception of the dormitory and glasshouse, every building is open not only to members of the school, but also to local residents and outsiders. Most of the sports facilities, including tennis courts and schoolyard, are open to citizens with prior booking. Also, the Music Building, Birch Hall, and some other buildings can be reserved after a talk with the school department of general affairs. Additionally, the Main Library and parking lot can be used with only a few restrictions. With a deposit payment of around 100,000 KRW, residents of Dongdaemun district can enter and check out books from the library. However they cannot use the study room in the building. 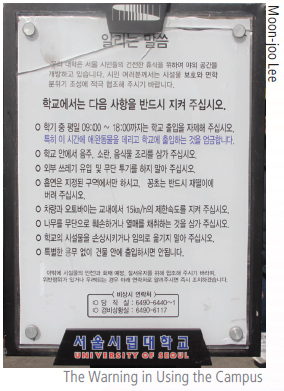 Also, the school’s parking lot is open to Jeonnong 2 Dong residents at a cheaper fee than residents of other areas. Currently, about 20 people are using the Main Library, and some residents use our school’s parking lot due to lack of space outside the school. Also, there is lots of floating population at school, especially at night on weekdays for working out, and on weekends by teenagers using it as a park. Present conditions related to an Open Campus are equal to or more open than other universities. For example, at Yonsei University, they do not allow non-students to borrow books from the library. Also, citizens are only allowed to enter their library after applying in advance. Their floating population is less, as our school’s location is much closer to residential areas than their campus. An Open Campus is very important in every university, but our school has more concerns and necessity for this. Our campus has various advantages that attract nearby inhabitants; different characteristics from other universities. 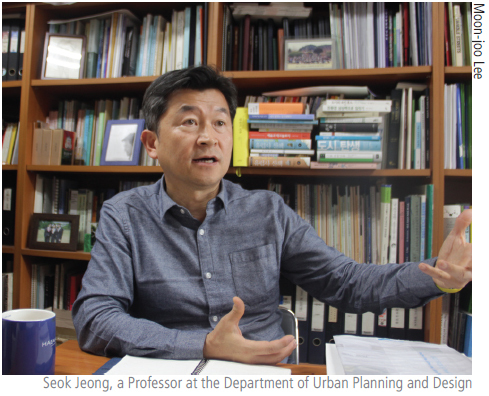 During an interview with Soon-tak Suh, a professor at the Department of Urban Administration, he mentioned that the high percentage of low-rise buildings and the fact that our school is funded with a high percentage of citizens’ tax are reasons for the frequent visits from local citizens. He contended that our school should allow access to buildings, but with some restrictions. One of the survey respondents conducted by The UOS Times mentioned this problem that the school should keep outsiders away from the private sectors of some buildings, like lockers in the Main Library. These contentions make sense since there are some instances of residents coming into the building without any security consideration. According to Daenamu-sup, the UOS Facebook page, there are an old man at the Student Hall who does not leave the building for a long time. Also, there was an old lady who took classes, not in a position of an undergraduate, but as a resident. Like this, he insisted that before continuing to open the campus there should be preceding preparation for our openness, such as with ID cards, like in the Main Library. The UOS Times conducted a survey to know how students feel about having an Open Campus to citizens and which aspects of this they are annoyed with. With about 160 students’ replies, more than half the students, 56.4 percent, felt uncomfortable about citizens utilizing campus (Question 1). When it comes to the area of campus that is uncomfortable, the most annoying place is the Main Road (Question 2). At that place, there are various problems: smoking, missionary work of religious cults, sexual harassment, trash, noise, pets, and so on. One of the respondents told of her discomfort while walking down the Main Road, where she was approached by missionary workers more than three times just as she arrived at school. Another respondent said, “At night, I saw some middle-aged men were drinking on the bench beside the Main Road. Moreover, they yelled and sang loudly.” One of the biggest problems students mentioned was the noise. Not only old men and adults, kids yell and play games all around the campus, especially on weekends and night, which annoyed many students. For example, there is a study room on the first floor in the 21st Century Building, which is very close to the Main Auditorium, which suffers from the noise of local residents every weekend. Families get together in front of the Main Auditorium, to have a picnic with a tent. Inhabitants do not realize that students and professors are doing experiments, studying, and researching in the building on weekends and nights. According to Siwon, the Student Council, they react to these problems at the UOS online community, Gwangjang and Danamu-sup, with an immediate reply and ask for support from the school. In other words, the Student Council usually works as a bridgehead between students and school, especially with the school department of general affairs. Other than this, they can carry out some campaign by hanging out banners saying phrases like “Please be silent and do not drink, consider students are studying hard for their dream.” About half of the respondents ? 47.2 percent ? said that a campaign to improve citizens’ consciousness is important to avoid a conflict between school and citizens (Question 4). Siwon said they are doing their best to minimize the conflict as far as they could. UOS is doing more institutional acts to root out this chronic matter. 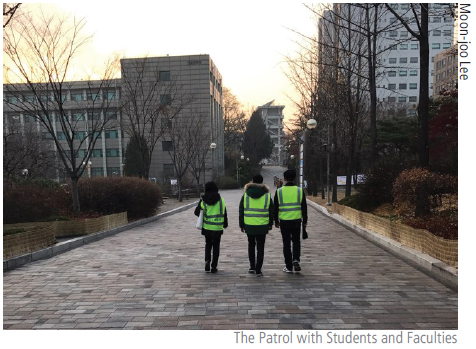 First, two groups of people, composed of four students and four faculties each, patrol around the campus, wearing yellow vests and carrying traffic sticks, on weekday evenings. The President of UOS has even recommended the patrols start on weekends as well, which they will by the end of the year. Second, there are some elderly men at school who are hired by the school to patrol during daytime and weekends. They are people aged over 65 who used to work at school as cleaning men for over 10 years. 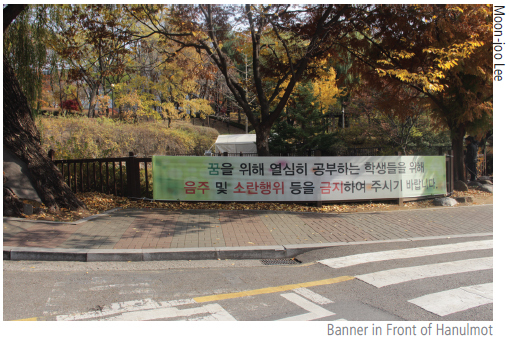 Gwang-seon Park, the chief of general affairs department, said these people’s employment has two positive parts toward securing our campus. One, since they are older men, when they restrain or warn residents from doing something, residents obey their warnings. They are more effective than students or security guards when dealing with elderly residents due to their age similarity or superiority. The second positive aspect is related to their work. They worked at our school for more than 10 years and have a great attachment to the school, which makes them work very hard with a lot of pride even on weekends. Park said the purpose of patrols is to alert the wrong behavior. The patrol’s existence itself is helpful to prevent citizens doing disturbing behavior. By having the patrol at school, missionary works of religious cults and sexual harassment is drastically reduced. Third is intensive control in certain locations. The school designated some areas to patrol carefully, and even changed some of them, for example, the pavilion behind the Information and Technology Building. Students did not use that facility, but citizens used to enjoy the place as a drinking place after hiking. This caused constant noise and a lot of trash. So, the pavilion was removed and changed to a green place. Designated areas of intensive control include the benches behind the Cheonnong Hall and the grass in front of Haneulmot. Park added that sometimes employees of the school gather together and have an intensive control, and report a lot when they see something unacceptable. All of this has reduced the amount of trash and noise at school. Moreover, the department of general affairs at school is making a “Study Zone” in a specific section. 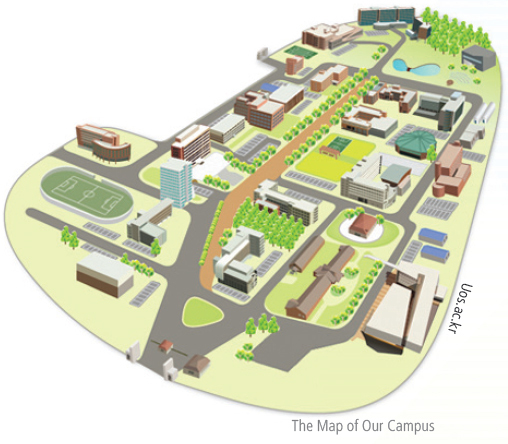 Looking at the campus map, Baebong Mountain is located at the back of the Main Library, Student Dormitory, and Information and Technology Building. This geographic characteristic echoes back the sound to the entire campus, which makes the school especially sensitive to the noise occurring there. This place is designated as a “Study Zone” and will be strictly watched. By assigning a “Study Zone,” more banners will be hung up and extra control will be introduced, with different indications painted on the ground. 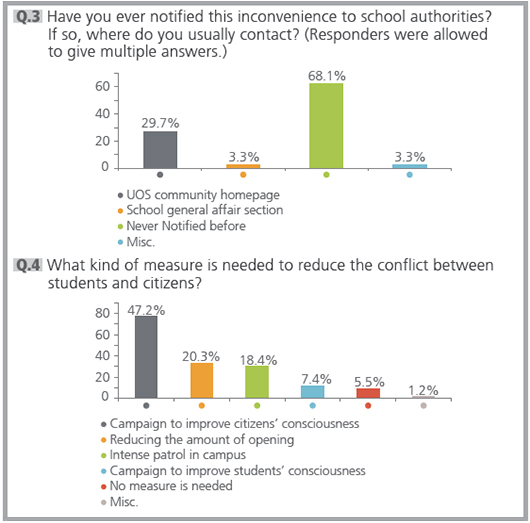 Conflict between citizens and students is mostly led by a few citizens. Most citizens realize that they should respect students’ right for learning. Because of a minority of citizens, students perceive that citizens are utilizing their campus recklessly. Students also think that is why UOS should reduce the Open Campus policy - 50.3 percent of students replied to lower the percentage of openness to citizens (Question 5). However, these mainly showed the stance of students. But as many residents use our school with respect, the focus should be how to root out this bad behavior and coexist with the majority. One resident told how she appreciates the problem of citizens using our school in a bad manner, and this reality will make the rift between students and citizens deeper and deeper, since there is no communication between each other. Students and citizens are all important elements of our community and students are resident in some part too; differentiating them is a bit meaningless. 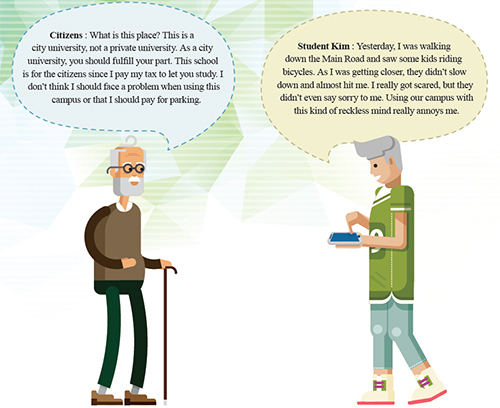 Students and residents can help each other and become good partners. To make a better society, they should understand one another and achieve harmony. In the survey and interview, many school members said there was an absence of communication and a severance between school and residents. Related to this, there are some projects and classes students have participated in, which can make citizens have a more positive awareness toward UOS; making a good awareness toward our school will make people respect using our campus. 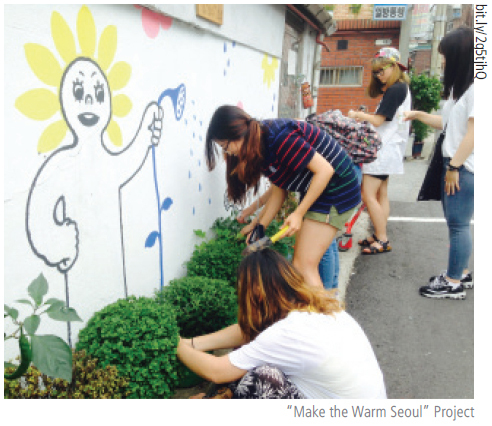 The “Sharing Side Dish Community” project, by UOS students was also part of “Making the Warm Seoul.” UOS students and local old ladies, mostly who live alone, made side dishes together and the part of the food was sent to elderly who live alone without family. On a group scale, both students and residents bought ingredient at a good price and with the help of residents, students made their side dishes successfully. Moreover, they volunteered for local communities by donating the surplus food. This program was effective in connecting students and residents. Through this process, they could share their ideas and understand both sides’ opinion and situation. Moreover, the image residents had in their mind of UOS had changed in a positive way. Unfortunately, “Making the Warm Seoul” project was disposed of in 2016 and the school has lost one way of giving residents a positive opinion toward our school. 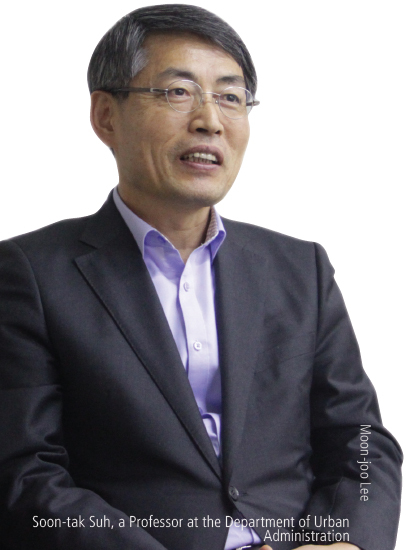 “These kinds of activities can place residents and students closer to each other”, Seok Jeong added. UOS is on its way to build Seoul Citizen Culture Education Hall, whose purpose is to celebrate UOS’ 100th anniversary. As this name suggests, it means that UOS will share knowledge and culture with citizens. 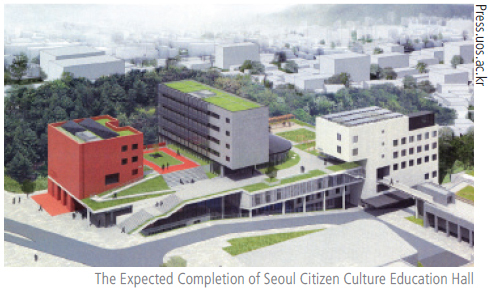 Seoul Citizen Culture Education Hall will consist of learning spaces, like classrooms, and space for citizens; an international conference hall, gymnasium, culture library, supporting center for composition, lifelong education center, and so on. All the space, except classrooms, will be open to citizen for free. This building will act as an important bridge between citizens and students. 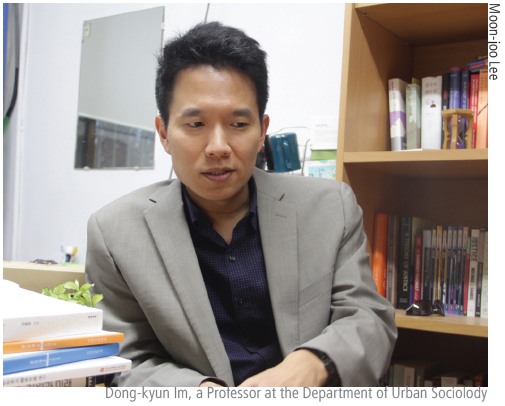 Dong-kyun Im, a professor at the Department of Urban Sociology, claimed there should be programs where citizens and UOS students can communicate when the Hall construction is complete. For example, students can work there as staff and teach what they learned or topics regarding their major. Right now, UOS students and citizens are strangers passing by in campus, but this direct exchange will make them acquaintance, and residents will have an attachment toward the campus. He also mentioned that it is hard to contribute to local society as an individual student, emphasizing the school’s work. Making a related program at a school level will be an effective way to contribute to the community. Moreover, the school should use local resources. If there is a vacant space or building in the district outside the school, the university could buy or lend it because we are always facing a lack of space. These spaces could be utilized as foundation centers, club rooms, research rooms, shared houses for students, and so on. By providing students or professors those places, that district will change. The silent and quiet district will be full of energy and local business could increase. Because of our Open Campus, many UOS students have experienced inconveniences and they may have a bad impression about citizens. However, it is important to remember that most problems come from a small minority of citizens and the school is doing its best to solve these problems. If we just feel bad about this and don’t have a solution or don’t communicate with residents, this just worsens the problems. We should find direct and indirect ways to communicate with residents and try to listen to them. UOS students and citizens can coexist happily and harmoniously, if we listen to each side’s voice and try walking in the other person’s shoes. Actually, this is presently going on around the campus. Per the online communities and survey, there are lots of examples of students getting annoyed. ■ People spread a mat and enjoy their picnic and then they leave trash where they were sitting. ■ At the Student Cafeteria, some citizens pack kimchi which is provided as a side dish for free. 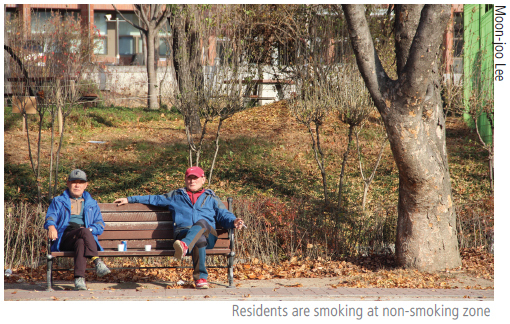 ■ Citizens don’t realize where the smoking area is and just smoke everywhere, even on the Main Road. ■ When we go to school, some citizens listen to music very loudly while exercising. ■ Some people pick some fruits from trees, even though it is illegal. I even saw two women who were cutting trees, at that moment I doubted my eyes in surprise. ■ Some people approach and initiate conversation by explaining about believing in god even though I say that I do not have time or I am not interested in those things. ■ At the school vegetable garden, residents take crops without permission, and don’t even notice the problem. The crops are cultivated by students with heart! ■ If you have a pet, you should have control of it. You should leash your dog and clean up his or her excrement. I don’t understand why this simple, natural thing is not kept.